Save the date and join us in Arlington! The VA-1 Tourism Summit will be held Nov 17-19 at Marriott Crystal City Gateway Hotel. More information will be coming in the next few months. Thanks to the many Virginia tourism partners who traveled to Richmond to participate in the VRLTA’s Day on the Hill in Richmond on Jan. 24th. The meetings with lawmakers and their legislative assistants at the General Assembly were productive as we were able to advocate for Virginia’s restaurants, lodging and travel industries. Please continue to keep abreast of issues that affect hospitality and travel in Virginia by periodically checking the VRLTA’s government affairs website at: www.vrlta.org/page/GeneralAssembly. 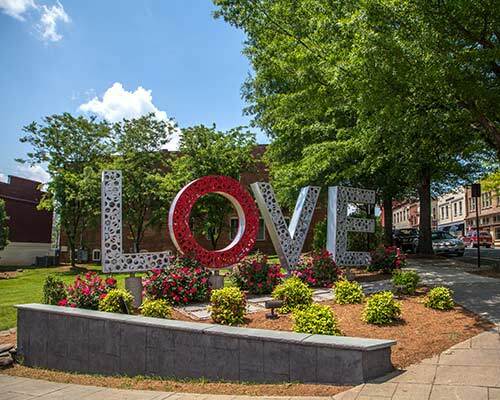 2019 marks the 50th Anniversary of Virginia is for Lovers and we are celebrating all year long with 50 YEARS OF LOVE. Our goal is to have the entire Commonwealth involved by hosting 50 YEARS OF LOVE activations – events, programs, promotions, etc. – for 50 consecutive days. Questions or ideas about what your organization can do? Contact Shannon Johnson at sjohnson@virginia.org. Visit vatc.org/50yearsoflove to learn all about the campaign and good luck to all of you who applied for the 50 Years of Love grant. Grant recipients will be announced February 14. The Virginia Tourism Corporation (VTC) Music Festival Sponsorship program’s purpose is to help promote the growth of – and to offset the costs incurred by – Virginia music festivals, and to also build Virginia’s brand as a music destination. American Evolution™ 2019 Commemoration Finale Grant Program applications are open! Applications are due on March 22, 2019. Maximum Award Amount $10,000. The purpose of the 2019 Commemoration Finale Grant Program – administered by VTC – is to provide Virginia organizations and communities with the resources to participate in the 2019 Commemoration, American Evolution’s Finale Month and to create a network of statewide partners who will bring the commemoration to their locality or region throughout the Commemorative year. The grant may be used for planning, execution, and/or marketing for events taking place between November 1-30, 2019. Events must reflect the theme of Virginia’s Customs, Cultures and Cuisines. Applications are due back no later than February 19, 2019 by 5:00 PM. The Commission was created by the General Assembly to plan, develop, and carry out programs and activities to commemorate the 100th anniversary of World War I and the 75th anniversary of World War II. The purpose of the program is to assist communities and related sites to market commemorative events, locations, and destinations. Placements are available for the 2019 eNewsletters. 3 positions are available at varying costs. See the calendar and specifications. See pricing and sign up for a placement here. Align your content marketing with ours. Download the 2019 Virginia Tourism Content Ideas Calendar. See what we are highlighting for 2019. Please update your listings on Virginia.org/Groups, Virginia.org/Meetings and SportsVirginia.org. If you need help, contact Stephanie Kenney. Also, let us know what’s new in your destination for groups, meetings and sports by filling out this form. Looking for new prospects? Visit the following links on VATC.org for a complete listing of our free tour & travel and meetings & conventions lead reports. Email Joni Johnson for sports marketing lead reports. March 13-14; May 29-30; Sept. 18-19 and Dec. 4-5. Cost: $45. Partner Offer! Concert Pre-Sale: Big & Rich coming to Richmond! All Star Country Music Jam featuring Big and Rich at Richmond Raceway’s Virginia Credit Union Live! on Monday, July 8th. This special is part of the Richmond Flying Squirrels All Star Week festivities. A special ticket price, $27.50, is available through Monday, February 11, for partners of VTC. VTC will be celebrating 50 Years of Love with the Norfolk Admirals Hockey team, Friday, February 15. Purchase tickets here and receive a discount for this night only. During an intermission, enjoy Virginia trivia and get ready for a VIFL t-shirt toss. There will also be a LOVEwork on-site to snap and post a pic with using #ShareWhatYouLove and #50YearsofLove. We hope to see you there! Congratulations to Kurt Krause who has been named president and CEO of Visit Norfolk. He most recently served as managing director for several hotel openings in Virginia, including Hilton Norfolk The Main, Hilton Virginia Beach Oceanfront, The Cavalier Virginia Beach and the Marriott Virginia Beach Oceanfront. Shiver in the River is Keep Virginia Beautiful’s largest event and is the coolest winter festival in Virginia! The event takes place February 23. Participants can help with the community clean up, do the 5K walk/run, or jump in the James River — or do all three! This inspiring day is surrounded by a unique festival complete with fun activities for all ages, music and food and beverages! Groups of all kinds are invited to participate as teams or individuals, and challenge others to be a part of the litter solution in Virginia. It Is Time To Register! The 6th annual Virginia Green Travel Conference & Awards are on April 24-25, 2019 at the new Madison Hotel & Conference Center in Harrisonburg. Come learn, share and leave inspired! Speakers have just been announced, and early bird pricing is still in effect.